It seems frozen yogurt (fro yo) places have been sweeping the country as of late, and it is a growing food trend. Boulder is no exception. In September 2011, Boulder 2008 Olympian Matty Reed and wife Kelly opened Boom Yogurt Bar as a place to be able to come eat some healthy yogurt and to just hang out. So, what sets Boom Yogurt Bar apart? First, their attention and focus to providing local, quality ingredients is something rare among fro yo places. As you walk in Boom, the wall to the left is filled with options of tasty frozen yogurt. Above the frozen yogurts, there is a sign stating, “All frozen yogurt contains live and active cultures: L. bulgaricus, S. themophilus, L. acidophilus, B. fidus and L. Casei. Local cows/ local milk = local yogurt. No artificial colors, flavors or sweeteners.” Not only are the yogurts providing a smooth, flavorful cold treat, but they are providing your body with beneficial bacteria and not the unnatural colors and flavors. Second, their unusual yogurt flavors set them apart. Boom yogurt regularly has Muscle Milk and Mix 1 frozen yogurt along with the usual frozen yogurts. Muscle Milk is a marketed recovery drink for athletes that is high in protein. In fact, one serving of Muscle Milk frozen yogurt from Boom provides 25 gm of protein. Mix 1 is a Boulder based company that makes all natural protein drinks geared for pre workout fuel and post workout recovery. Both provide a higher protein content great for recovery after a workout or as part as a healthy regular diet. Their unique flavors are rotated and can range from salted caramel, Bakti chai, Muscle Milk banana, Mix 1 blueberry, fruit sorbets, and more traditional flavors like country vanilla and chocolate. You can mix and match flavors if you can’t choose one. 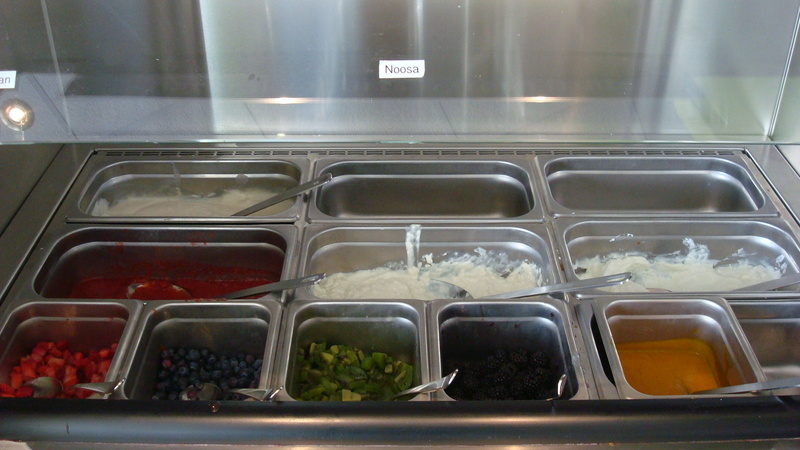 Boom Yogurt also provides fresh yogurt and/or cottage cheese as an option for the yogurt bar. They provide Noosa, Greek and soy-based yogurts. They also started offering an oatmeal bar for the morning hours and Evol burritos, another Boulder based company. Lastly, there are the Boom toppings. The local theme continues here. They offer different local granolas and locally made crushed up Breeze Bars. They have a wide variety of fresh fruit and fruit purees and other healthy toppings. Kelly wanted to offer more of a healthy spread, but there are still the sweet options like gummy bears and marshmallows. She notes that if kids want the gummy bears, they get to try a piece of the healthier gooey mochi balls. Other local toppings include: Justin’s nut butters, Jerry’s Nut House nuts, Kim and Jake’s cakes and more. They also started offering locally made Dizzy Donuts as a stand alone option or as a base to pile on top yogurt and toppings. Boom uses healthy yogurt bases with fresh, local toppings. Their place is locally inspired all around, and their Boom room is available for meetings and gatherings for free (they just ask you buy some yogurt while you’re there). Of course, as with any self serve food bar, calories can still add up quick, and your eyes can be bigger than your stomach. Stick with small amounts of toppings and remember you don’t have to try everything in one serving. Boom yogurt can be used as a nutritious snack, dessert, small meal or post workout recovery fuel. Options are endless!